US Secretary of State John Kerry signs the Paris Agreement at the UN in New York while holding granddaughter Dobbs Higginson on his lap. Scientists warn that the agreement is insufficient to prevent disastrous climate change. Photo courtesy of US Department of State. The Paris Agreement marked the biggest political milestone to combat climate change since scientists first introduced us in the late 1980s to perhaps humanity’s greatest existential crisis. Last December, 178 nations pledged to do their part to keep global average temperatures from rising more than 2 degrees Celsius (3.6 degrees Fahrenheit) over preindustrial levels — adding on an even more challenging, but aspirational goal of holding temperatures at 1.5 degrees Celsius (2.7 degrees Fahrenheit). To this end, each nation produced a pledge to cut it’s own carbon emissions, targeting everything from the burning of fossil fuels to deforestation to agriculture. It seems like a Herculean task, bound, the optimistic say, to bring positive results. Yet, less than eight months later, a study in the journal Nature finds that those pledges are nowhere near as ambitious as they need to be to keep temperatures below 2 degrees Celsius, let alone 1.5 degrees. And in August, British scientists reported that this year’s record El Niño has already pushed us perilously close to the 1.5 degree milestone. Meanwhile, temperatures are not rising evenly around the planet, with the Arctic warming far faster than the tropics. That fact originally caused scientists to hypothesize that polar ecosystems would suffer more dire climate change impacts ahead of tropical habitats. But over recent years, researchers began seeing that some tropical ecosystems are being decimated by climate change far faster than expected — think coral reefs — while many more habitats may be crippled over time ­— think mangroves, cloud forests and rainforests — if global human effort and political willpower don’t surge quickly. 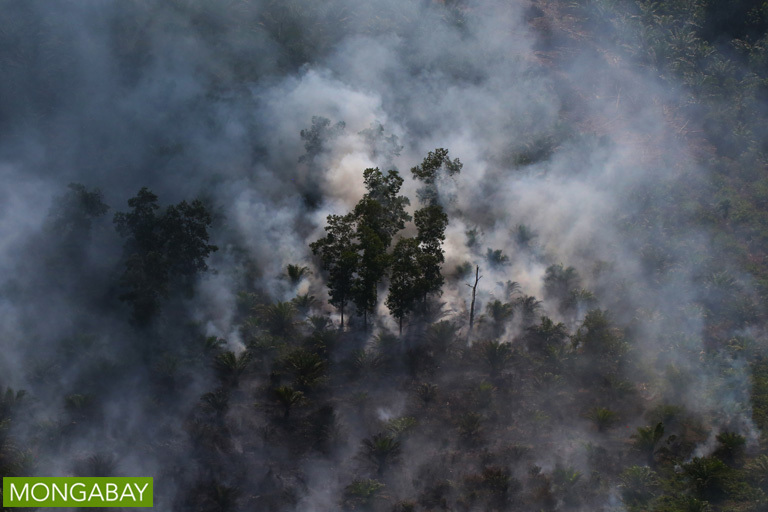 Study leader, Joeri Rogelj, told Mongabay that he wasn’t surprised by his findings showing that current national carbon reduction pledges would blast past the 2 degree target, leading to global warming of between 2.6 degrees Celsius and 3.1 degrees Celsius. The Paris Agreement was structured from the bottom up, whereby national pledges would be reviewed every 5 years (beginning in 2020) in order to make sure that carbon cut targets are boosted as time goes by. Still, Rogelj cautioned, if pledges aren’t sufficiently ramped up – and followed through on – it will make achieving the 2 degrees Celsius goal “significantly more ambitious” after 2030. While a temperature rise of 1.5 to 2 degrees Celsius, as opposed to 2.6 to 3.1 degrees Celsius, may not sound like much in numerical terms, many scientists have pinpointed the 2 degree target as the limit beyond which the world would face dangerous climate change. Impacts would likely, many say, become catastrophic if temperatures are allowed to come anywhere near 3 degrees Celsius (5.4 degrees Fahrenheit). Yet, for some ecosystems a 2 degree C rise in temperature is already going to be a catastrophe. Tropical ecosystems, just like Arctic ecosystems, appear to be particularly vulnerable because species there have evolved within very specific and often narrow temperature ranges. As many species face escalating temperatures, they may simply not survive. And temperature rise isn’t the only global warming impact to consider: extreme weather, ocean acidification, and sea level rise are all effects that are currently, and will continue to be, felt across the tropics. “We’re kidding ourselves that a 2 degree Celsius global increase will be safe for coral reefs and for the people who depend on them, given the damage we’re already seeing,” Terry Hughes bluntly stated in a Mongabay interview. “Most reefs have already bleached three or more times in less than 20 years,” explained Hughes, who is the Director of theAustralian Research Council (ARC) Centre of Excellence for Coral Reef Studies. He points to his own country’s global warming-catastrophe: the Great Barrier Reef. Super-warm waters this year led to around half of the coral in the northern section of the Great Barrier Reef dying off. In some places, nothing is left but white coral ghosts. These massive changes came far earlier than were forecast by climate models. Tropical corals — tiny animals that build up reefs over time out of the exoskeletons of their ancestors — live in a complex, symbiotic relationship by trading nutrients with single celled algae called zooxanthellae. It’s these zooxanthellae that lend corals their splendid bright colors along with the bulk of their energy. But when coral reef water temperatures get too high, the coral expels the zooxanthellae and the symbiotic partnership, at least for a while, is shattered. This is called coral bleaching and it doesn’t mean the coral is dead – yet. But it is starving. Corals can recover from such bleaching events, but not if they occur too often or if the waters simply become too hot for the zooxanthellae to return. If that happens, a tipping point is reached where the coral will starve for energy and the whole reef is at risk of dying and being taken over by seaweed — setting up a new, less biodiverse marine ecosystem. “This is the third global bleaching event since the first one in 1998, triggered by a rise in average global temperature of just one [degree] Celsius,” Hughes noted darkly. What’s happened on the Great Barrier Reef due to a 1 degree Celsius rise is almost beyond comprehension — a 2 degree Celsius increase and the world’s biggest coral reef and one of the globe’s greatest ecosystems may be eradicated — something that could happen within a few decades. While nearly 50 percent of the northern Great Barrier Reef was lost this year, the southern portion was also damaged. In all, around 90 percent of the entire ecosystem was hit by this current bleaching — an event linked to high El Niño temperatures supercharged by climate change. The Great Barrier Reef is not alone: what happened there is just a part of a vast global bleaching event that began in 2014 (the longest yet recorded) which is striking many of the world’s reefs with similar devastation. The full impact will likely not be known for months, if not years. This mass-bleaching event, combined with recent ones, raises a serious question: can coral reefs survive any further climate change? Or have they already hit their survival threshold? Jan Lough weighs in, asserting that the “only acceptable level” for coral reefs is the Paris aspirational goal of 1.5 degree Celsius. But this is a goal some scientists believe we have already passed, or inevitably will pass shortly — there already being too much heat in the climate system to avert this temperature increase. Add to this the fact that even if global carbon emissions begin to fall soon, it’s extremely unlikely they will fall fast enough to conserve the bulk of the planet’s coral reefs. And science tells us that simpler ecosystems tend to be less robust and more vulnerable to stressors. Among those escalating stressors: ocean acidification — caused when high levels of atmospheric carbon are absorbed by the oceans. Acidification at high levels could eventually cause corals and shellfish to melt away into the seawater. Tropical coral reefs are arguably the ocean’s most important ecosystem. They are by far the most biodiverse marine habitat: although they cover just one percent of the ocean’s surface, it’s estimated they may house a staggering 25 percent of the world’s marine species at some point in their lifecycles. That is bad news for human beings too: coral reefs are vital to many of the world’s fisheries and provide food and work to hundreds of millions of people. There is some good news on the climate change front regarding tropical coral reefs. Last year, scientists reported finding a reef-building refuge for corals — they hide from high temperatures and acidification extremes by growing in the shade of mangrove tree roots. But now, the bad news: other scientists have found that mangrove forests are being seriously impacted by global warming and sea level rise. Norman Duke, an expert on mangroves with James Cook University, suffered a terrible shock in June when he flew a helicopter over northern Australia’s Gulf of Carpentaria to witness a reported mass die off of mangrove forests in an otherwise remote and healthy region. Duke estimated that this mass mangrove death covered some 7,000-10,000 hectares (17,297-24,710 acres). Looking at past satellite images, he was able to confirm that the mangroves only died during the past year. He believes super-hot temperatures, combined with a lost rainy season are responsible. The mangroves simply couldn’t stand up against the one-two punch of extreme drought combined with climate change. Duke now believes the Gulf of Carpentaria mangrove ecosystem could change over time into saltmarsh and saltpans. “Where rainfall is higher, then these wetlands are dominated by mangroves, and where rainfalls are low, then these same wetlands are dominated by saltmarsh and saltpans,” he explained. This year’s die off, emphasized Duke, was “an extreme response instead of the previously observed gradual shift in the zonal ecotones.” Climate change is popularly presented in the media as unfolding slowly over decades, with a gradual shift in temperature and precipitation regimes. But the reality we are seeing in the tropics and elsewhere is sometimes quite different, with some years (such as 2015-16) bringing sudden, abrupt temperature increases accompanied by drastic shifts in rainfall levels around the globe. In the same way that coral reefs in a warmer world could be suddenly forced past a tipping point into a new type of ecosystem dominated by seaweed, mangrove forests could shift to become less-biodiverse and less productive saltmarsh, saltpan, or other type of ecosystem. The climate change double punch of increased heat and drought could even prove to be a quadruple punch: mangroves are also threatened by rising sea levels and by extreme weather events, such as global warming-induced super-storms. Mangroves already represent some of the best buffers against intensifying extreme weather along coasts worldwide, but battering by too many severe storms can take its toll and weaken mangroves already struggling against rising temperatures and more erratic rains. Studies have shown that warmer seas are breeding more intense hurricanes, a reality that will escalate as global atmospheric and ocean temperatures climb. Sea levels will also continue rising — due to both the expansion of ocean water as it is heated, and the melting of land-based glaciers. 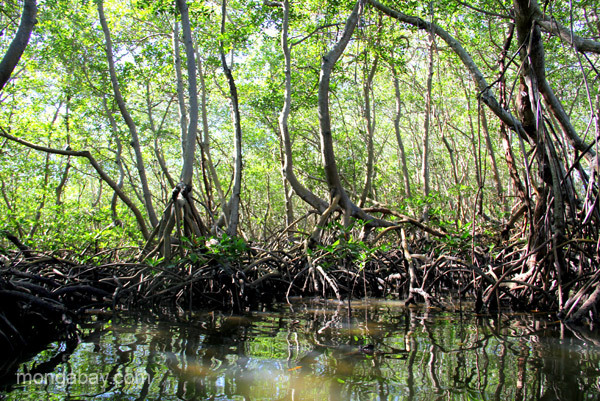 As that happens, marine waters will swamp many mangrove forests, eventually likely killing them. One ray of hope for mangrove forests: rising sea levels may allow this ecosystem to move inland, taking over freshwater marshes as they become inundated by salt water — but such a takeover depends on many factors. The potential for mangrove expansion also doesn’t take into account the rapid degradation and clear cutting of mangrove forests to make way for fish and shrimp aquaculture operations to feed the globe’s rapidly rising human population. Predicting the impact of climate change on rainforests is difficult, but scientists expect some major shifts and potential shocks. One way in which climate change is expected to hit rainforests is by changing rainfall levels, likely increasing the length and intensity of droughts and thereby increasing the risk of wildfires. But continuing drought this year, NASA warns, has left the Amazon drier than any year since 2002. Doug Morton, an Earth scientist at NASA’s Goddard Space Flight Center, said in a press release that the regional drought has “set the stage for extreme fire risk in 2016 across the southern Amazon.” The risk of fire from July to October exceeds levels seen in both 2005 and 2010 when vast areas of the Amazon rainforest burned. Intensified droughts and wildfires certainly harm wildlife and plant life in the tropics where species haven’t adapted to fire as in temperate forests.. Such events also have another impact: they worsen climate change. Last year’s Indonesian wildfires, for example, released more carbon than the entire US economy over the time period the country was burning. In the Amazon, extreme drought in 2010 impeded tree growth and increased tree death, shutting down the Amazon’s vast and vital carbon sink, temporarily preventing carbon storage across the region. And of course, the shutdown of tropical forest carbon sinks could mean more carbon in the atmosphere, worsening in turn the global warming impacts on rainforests. “We can say that rising temperatures, particularly accompanied by drought, are likely to limit rainforest atmospheric carbon uptake and most likely lead to tree mortality.” But part of what makes forecasts difficult, according to Rowland, is that warmer temperatures and drought in rainforests are also offset in part by increased levels of photosynthesis fueled by rising CO2 levels. Unfortunately, non-plant species will receive no such compensation. A recent study in Scientific Reports found that even with a warming of only 2 degrees Celsius, some animal populations (as well as many human populations) may have to move as much as 1,000 kilometers (621 miles) over less than a century in order to stay within their current temperature regime. And of course, the specific trees, shrubs, or flowering plants which those animals associate with, and rely on for food and other needs, must likewise somehow move along with them. Those species unable to move or adapt will go extinct. While scientific uncertainties make climate change effects on rainforest ecosystems hard to predict, the impacts on tropical cloud forests are more straightforward. In fact, “cloud forests are among the most vulnerable terrestrial ecosystems to climate change,” according to one Nature study. Like rainforests, cloud forests thrive in a very particular temperature range and require a significant amount of moisture. But cloud forests are also found in high mountains; they crown summits at very specific altitudes in great luminescent rings of green, and require almost constant cloud cover — hence their names — to survive. Scientists predict that as the world warms, cloud forest plant and animal species will be forced to migrate upslope to stay within safe, livable temperature ranges. Indeed, researchers have already documented cloud forest plants attempting to move upward. But already scientists are finding that although some plants are migrating toward mountain summits, they are not doing so fast enough to keep up with rapidly rising temperatures. And those migrating forests could hit roadblocks. A 2013 study presented in PLOS ONE found that cloud forests in Peru were finding it difficult to move into the habitat occupied by the puna grasslands above them. The researchers don’t know why this is the case, but it may spell doom for many of the plant and animal species in this region unless humans intervene and provide assistance. Many cloud forests will also run into human-dominated landscapes, such as livestock pasture or montane agriculture as they try and move upslope. Also, as temperatures climb up the mountain, that will open the door for the large scale movement of lowland species upward, potentially resulting in conflicts with upland species. In Costa Rica, one researcher reports that 25 lowland bat species have already moved up into the famed Monteverde Cloud Forest. Climate change may also shift cloud cover and life giving rains away from tropical cloud forests. Without clouds, cloud forests and the unique wildlife and plants they support are unlikely to persist. The Monteverde cloud forest is already seeing such drying out. If global temperatures rise unabated, cloud forests will eventually be forced to retreat higher and higher up mountain slopes, until upon reaching the very peaks, they simply have no place to go. With no escape route to cooler climes, submerged in heat, cloud forest species would be obliterated. But as temperatures rise, there is no question that impacts will follow suit. “The greater the rise in temperature the worse the consequences,” noted Duke. Mark Urban, with the University of Connecticut, in a study last year looked at extinction risks for species linked to climate change. To get the best estimate possible, Urban analyzed findings from 131 studies. He found that currently 2.8 percent of species face extinction due to climate change — this with a warming of around 0.9 degrees Celsius. If that warming jumps to the Paris pledged 2 degrees, extinction rates could rise to 5.2 percent of all species on the planet. And if we hit 3.1 degrees Celsius this century, as projected by Joeri Rogelj’s study, which totaled up the current Paris pledges and the maximum temperature rise they could bring? Then we could lose 9 percent of the world’s species due to global warming. That’s nearly one-in-ten species facing extinction from climate change — and of course that doesn’t figure in extinction from other human induced threats like habitat degradation and destruction, deforestation, pollution, overharvesting, poaching, invasive species, or a lethal combination of any two or more of these combined with climate change. It’s also important to realize that climate change impacts, including extinctions, won’t suddenly just cease in 2100. Without action they will continue apace into the next century. That’s why “nations have to start implementing their [Paris] pledges without delay.” said Rogelj. He added that he hoped studies like his “help countries to increase the ambition of their pledges, even before 2020.” That’s the year when countries must come up with their second round of pledges. But cutting emissions is only part of the answer. Warming is already occurring and will keep occurring due to the climate forcing already introduced into the climate system. And ecosystems are already suffering its impacts, as are many human populations. As a result, William Laurance, a rainforest ecologist with James Cook University, asserts that conservationists should also turn to an old, but tried, tool to combat climate change: protected areas. “In terms of [climate] mitigation measures, the best strategies are to conserve large, topographically and climatically complex, and interconnected protected areas,” he said. “This will give species the best chance to move or find refugia during extreme climatic events.” Those large core areas could be linked by wide wild corridors that allow for mass animal and plant migrations to adjust for climate change. For species and ecosystems in dire straits, humans will have to decide whether or not to intervene. Should we pick up and move species to help them remain in the right climate? Should we bring especially climate-sensitive species into captivity to create insurance populations — captive refugia — against extinction? Could some ecosystems only survive in manmade climate-controlled facilities, with hopes that one day the world could be rewilded? At the same time, Laurance said, conservationists can’t ignore other threats “such as poaching, illegal fires, and habitat fragmentation” that could wipe out species already struggling in a warming world. In addition rapid research and response scientific teams may be needed to respond to climate change induced ecosystem emergencies already impacting endangered species and biodiversity hotspots. Paris was a first step. But it was a late step — the world has already warmed 0.9 degrees Celsius. Now countries must struggle to achieve individual carbon cut pledges that will add up to meet the overall goal. Then in 2020 — or preferably before — they will need to step up and redouble their efforts to meet new more stringent goals. This was always the plan, but it won’t be easy. However, coral reefs and cloud forests haven’t the time to wait. And nature does not negotiate. Nor does the 2 degree Celsius goal set in Paris offer any real assurance to the survival of many tropical ecosystems and species.